Today’s guest on the Answers From Leadership podcast is Alli Polin. Alli believes that leadership lessons aren’t only found at work, in a class, from a book, or a title. Personal leadership lessons are present in everyday life – you just have to be open to embracing them. Leadership is a part of who you are, not only what you do. It’s your way of being, connecting, and in relationship with others. With that, let’s get into today’s Answers From Leadership podcast episode. I am an American Ex-Pat who lives in the Australian outback. I’ve transitioned not only my life but my work to here. I’ve worked in various organizations. And I’ve seen good leadership and inexperienced, really just terrible leadership. My view of leadership is that it’s not about being able to inspire big groups or divisions. But it’s about making a one on one meaningful connection. We all face difficulties in leadership. Would you mind sharing one or two difficulties you’ve encountered and what you’ve learned from them? When my children were young, I left my career. I went back into the workforce when my son was 2 and my daughter was 4. I went to a small recruiting firm and I started their talent development consulting practice. It was this beautiful little family. We worked really hard but it was a great, intimate culture. Then we got bought. I think one of the biggest challenges for me was recognizing where my values and the ways I like to lead and work were just a horrible cultural mismatch with the new organization. And I struggled through it for a year. You co-authored a book with a former podcast guest, Karin Hurt, about children in leadership. Do you believe children can really grasp the idea of leadership? I don’t think really young children can really, fully understand leadership. I think they’re still forming what it means. What I think what we can do and what they can grasp is that leadership is kindness and leadership is caring and leadership is supporting and leadership is trusting and all those qualities that you and I want to see in leaders, we can help them understand those qualities are in them. How do you get children interested in that kind of leadership? I’ve found that it’s finding those moments to have a meaningful conversation. 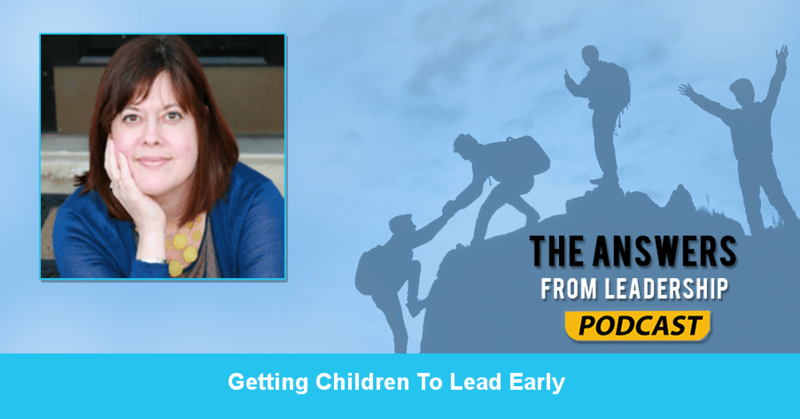 Are there any issues that arise from getting your child to lead early? I personally don’t think there are. It’s all about what we call leadership. I’m not going to push my student to become student council president as if that’ the only way to lead. What we can all do is to teach them that leading early takes many different forms. Do you have any other books you’d recommend to help a leader grow? I would say that if I were to leave one thought, it would be to challenge yourself to find moments of everyday leadership. Where can listeners connect with you?